Disney XD has released two clips from their highly-anticipated Guardians of the Galaxy animated series, which debutes with a special sneak preview on Saturday, September 5. Before they became the Guardians, five outlaws made their way through the galaxy...And got into plenty of trouble along the way. These shorts tell stories from the checkered pasts of Peter Quill, Groot, Rocket, Drax and Gamora. See what happens right after little Peter Quill is beamed aboard that Ravager spaceship and meets Yondu and his alien pirates. Guardians of the Galaxy features themes of redemption and the importance of friendships and family told through a series of riveting sequential story arcs. The series follows the newly formed team that finds a strange artifact keyed only to the DNA of Peter Quill. Upon opening it, Quill unleashes a treasure map leading to a powerful weapon known as the Cosmic Seed, which is capable of giving birth to the next universe. It's up to the Guardians to find, protect and ultimately destroy the Cosmic Seed in order to keep it out of the hands of those who would abuse its power, from galactic big boss Thanos to the conniving brothers the Collector and the Grandmaster, to a resurrected Ronan, to the ultimate trickster, Loki, in order to save the universe. These new sneak peek videos featuring Star-Lord are the first in a series of brief two-part videos that reveal new details about each of the main characters. For those who want to watch the Star-Lord videos on their TV, Part 1 will air Saturday, August 1 at 8:58 p.m. ET/PT, with Part 2 airing at 10:28 p.m. ET/PT. Groot follows on Saturday, August 8 (Part 1 - 8:58 p.m., ET/PT & Part 2 - 9:58 p.m. ET/PT), with Rocket Raccoon on Saturday, August 15 (Part 1 - 8:58 p.m. ET/PT & Part 2 - 9:58 p.m., ET/PT), Drax on Saturday, August 22 (Part 1 - 8:58 p.m. ET/PT & Part 2 - 9:58 p.m., ET/PT) and Gamora on August 29 (Part 1 - 8:58 p.m. ET/PT & Part 2 - 9:58 p.m. ET/PT). Featuring the hugely popular characters introduced in the record-breaking Marvel Studios film of the same name, the series stars Will Friedle (Boy Meets World) as the brash adventurer Peter Quill/Star-Lord, Trevor Devall (Johnny Test) as fan-favorite Rocket Raccoon, Vanessa Marshall (Star Wars Rebels) as the enigmatic, expert fighter Gamora, David Sobolov (Transformers: Prime) as the rough-edged warrior Drax the Destroyer, Kevin Michael Richardson (The Cleveland Show) as tree-like humanoid Groot and James Arnold Taylor (Star Wars: The Clone Wars) as leader of the space pirates Yondu and the telepathic dog, Cosmo. Produced by Marvel Animation, the series' award-winning creative team includes executive producers Alan Fine (Marvel's The Avengers, Iron Man, Thor), Dan Buckley (Avengers Assemble, Hulk and the Agents of S.M.A.S.H. ), Joe Quesada (Avengers Assemble) and Jeph Loeb (Marvel's Agents of S.H.I.E.L.D.). Marvel's Guardians of the Galaxy joins Marvel's Avengers Assemble and Hulk and the Agents of S.M.A.S.H., Disney XD's Top 2 original weekend animated series in Total Viewers and target kid and boy demos. 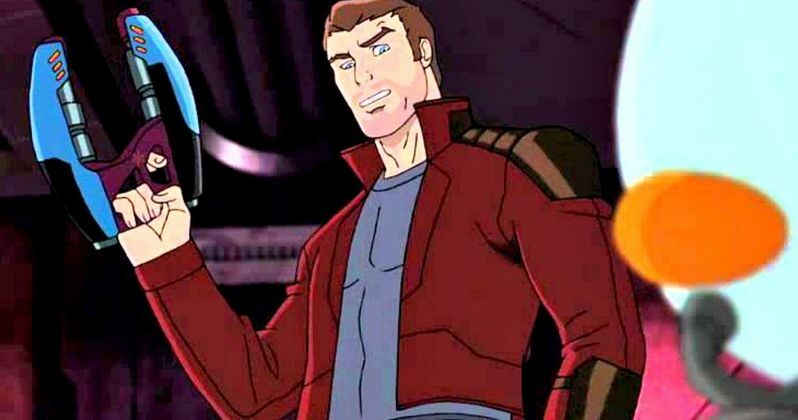 Disney XD debuts sneak peek at first episode of Marvel's Guardians of the Galaxy at 9:00 p.m., ET/PT. The first episode, entitled "Road to Knowhere", follows the newly christened Guardians of the Galaxy as they come into possession of a dangerous artifact that has Thanos' new lieutenant, Korath, after them. On Saturday, September 26, the one-hour premiere (9:30 p.m. - 10:30 p.m., ET/PT) will feature an encore presentation of "Road to Knowhere" followed by "Knowhere to Run". In "Knowhere to Run", the Guardians struggle to subdue the suddenly sprung-to-life Celestial head that is the Knowhere space colony, as well as storm Korath's ship to rescue Quill, Gamora and the mysterious CryptoCube that holds the Cosmic Seed. Visit iTunes to check out Part 1 of Star-Lord's sneak peek, then take a look at Part 2 below.